I remember a song called, "I'm on the Outside Looking In." Well, here we are in a fifth floor apartment in an historic building on Peachtree Street in Atlanta on the inside looking east towards Ansley Park, one of the city's oldest neighborhoods. My friend Jim Landon has lived in this wonderful space for years. He's a Harvard educated lawyer - now semi-retired - and a fantastic gardener. Although he spends a lot of time at his house in Highlands, N.C., where he has an expansive garden, it was here in this window box that he cut his teeth, so to speak. The window box is 22 feet long, two feet wide and two feet deep. Jim used to keep it chock full and rather wild looking. For a long time, he had silver lace vine (talk about a rogue grower) trained to frame the window. A lilac bush grew in the box along with other shrubs like hydrangeas. When this photograph was taken for the newspaper, Jim had changed things up. 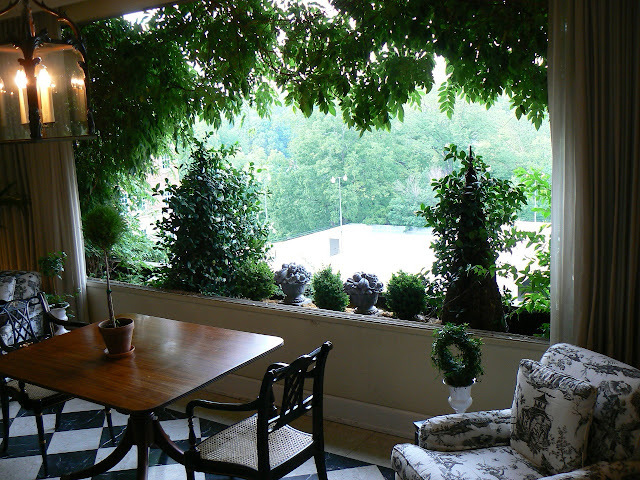 The vine you see framing the window is Wisteria frutescens, a U.S. native that is way tamer than the Chinese thug. In late April- early May, the sweetly scented racemes resemble five-inch long purple clusters of grapes. For structure, he covered two pyramids with evergreen Confederate jasmine. In May, the plants are smothered in white star-shaped flowers that perfume the air. Between the two pyramids are alternating dwarf boxwoods and cast lead ornaments in the shape of fruit baskets. On either side of the pyramids are plantings of variegated Gardenia radicans. That giant window you see couldn't be open on this steamy hot, mid-90's day. But, in spring, on milder summer nights and in the fall, the open window - coupled at times with a full moon rising over the trees to the east - makes this room is a magical place to be.